The Genk track crowned Patrik Hajek and Matteo Viganò world champions in KZ and KZ2 Super Cup. 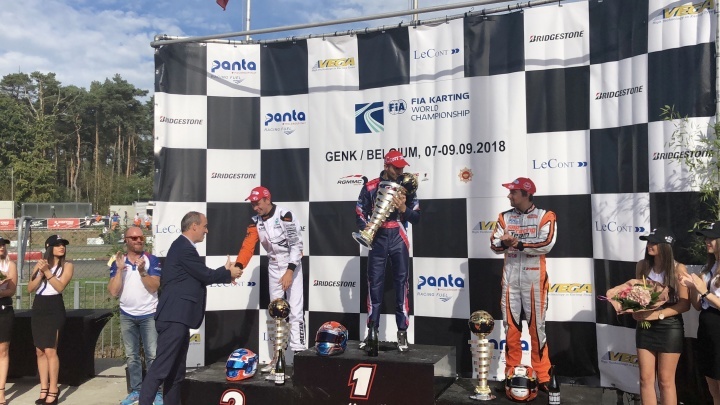 The CIK FIA season for the gearbox classes ended in Genk with the victories of Patrik Hajek in KZ and Matteo Viganò in the KZ2 Super Cup. KZ - Hajek kept his first place after the red lights went out, taking Marijn Kremers and Rick Dreezen along behind him, the latter then overtaken by Simo Puhakka. Puhakka and Kremers soon clashed, a fight that saw both drop to the end of the grid after a contact at the last corner. This episode allowed Dreezen to regain the place of honor, followed by Fabian Federer. The three managed to continue in the same order for the rest of the race, while behind them a combative Alex Irlando came back from the 8th spot. The 5th position went to Paolo De Conto, who showed the talent that has won him his numerous titles, recovering as many as 9 positions from the start. Genk did not smile on Jonathan Thonon, retiring; same fate also for Anthony Abbasse. At the end of the demanding program of direct matches, the final starting grid for the International Super Cup KZ2 was set. Pole position to Matteo Viganò, after five victories out of six available heats, definitely on pace for the final. At the ready, the Italian starts better than everyone, protects the first braking point from the onslaught of Adrien Renaudin. Sole bit of work for Viganò, who remained first and whose lead was never in question for all 23 laps of the final, a hellish pace the Tony Kart's driver, demonstrated since practise and confirmed at the decisive moment. Behind him, a round of applause for the surprise of the weekend: Daniel Bray, the New Zealander surprised the competition with his third place on the starting grid and the excellent race pace, not enough to grab the title. Last on the podium, the category rookie, David Vidales, fifth for almost the entire final, the Spaniard made the most of the suicidal rivalry of his opponents in the last laps, to grab the bronze medal. Just off the podium, the excellent Gaetano Di Mauro, fourth place finish for the Brazilian stock car driver, able to exploit the great CRG competitiveness during the heats. Missed third place due to a contact with Renaudin in the last laps, the same that favored Vidales. Fifth place finish for the European Champion Renaudin, never able to attack the leading positions. Third and last appointment with the CIK FIA Academy, widely honored by all the young drivers present. Kobe Pauwels wins in front of his home audience, a tight fight against Mari Boya, new Champion and forthcoming competitor for the Kristianstad World Cup.